What do you bake in yours? POLL NOW CLOSED – THANKS FOR ALL YOUR COMMENTS. Click here to see our most recent polls and poll results. The Great British Bake Off is well underway, and it got the cooks and chefs amongst us at Caravan Guard thinking about what we like to bake when we go away. As we join the country in celebrating all things great about British food, this month’s poll is about cooking in your ‘van! We’d like to know what you like to bake or cook when away from home to get those taste buds going? Do you still like to fire up the oven, turn on the grill or hob, or is it microwave meals or a trip to the local pub so you can truly get away from it all and relax? Feel free to share any of your top cooking or baking tips or quick and easy recipes! 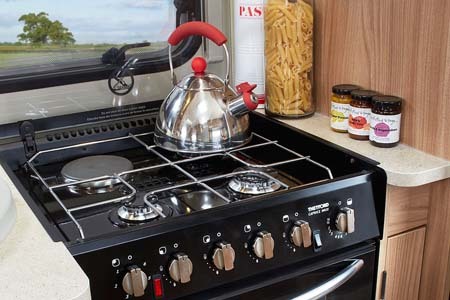 We’ve picked some foods we think you might like to dish up when in your tourer or motorhome. Looking at the poll options on the left, please pick your favourite or check the “other” box and tell us what it is you like to serve up to yourself or your loved ones whilst enjoying your freedom. We’d love to hear from you and we’ll publish our favourite comments and results next month. Cast your vote using the options on the left of the page. If ‘other’, please add a comment to let us know below. We use M & S Dine in For Two offer when available – good meal with minimum fuss, minimal washing up (if you select dishes that can be cooked in their containers) plus a nice bottle of wine to wash it down! best of all make use of caravan and camping club’s eat local campaign and eat out!!!! Not heard of a remoska before Angela but sounds like it makes some delicious meals. Sounds great if one always limit ones travels to sites that give a hook up. Just returned from Norway where the majority of nights were spent ’wilding’ or in a farmers field. What we want is a good selection of dishes to cook on a gas hob or grill! My old (H reg) campervan only has two burners and a grill, though l do have a little microwave, so l tend to have one pot dishes or fry ups. I know its not the healthiest but it does taste good! You can’t beat a one pot dish Morag! I have a romesca cook pot, and take a micromave (but not for ready meals) we love Jacket potatoes and salads, and stews made in the cook pot. Thanks Liz – the cook pot is a great idea. I am a keen cook and anything that I cook at home, I can cook in the caravan. With four burners, a grill, a microwave and an oven, nothing is off limits. We bought an extra shelf for the oven to make the most of it. The first meal I ever cooked in a caravan kitchen was a full roast beef meal with roasted veg, boiled vegetables, gravy, Yorkshire puddings and apple pie for dessert – the full Monty. we’d had the caravan for just one day and haven’t stopped cooking in the caravan since then!. Wow Liz that’s fantastic! It’s great that you make full use of your cooking facilities and that nothing is off limits. Some very healthy meals there Andy! Pizza ….how could you miss this off your list! Thanks Nora. Really good suggestion. Rack of lamb with new potatoes and asparagus, with mint jelly! Great suggestion Tony – and very healthy too! Thanks for the great tip Bryan. Homemade Bhuna Curry is a favourite in the caravan. Anything I can cook at home I can cook in the van but we only have a small oven with one shelf, so I tend to make stove top meals more.